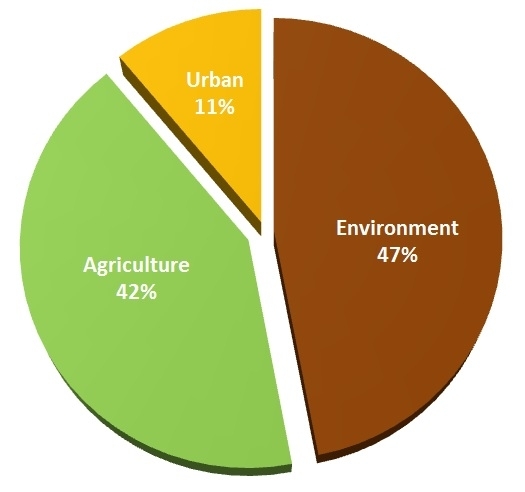 Average annual precipitation in California is 200 million acre-feet, out of which 42% of water is used for agriculture while 11% is used in the urban areas (municipal and industrial users) and the remaining 47% by the environment (native vegetation, ground water, and oceans) (Doug Parker, personal communication). According to the National Drought Mitigation Center's Drought Monitor, 95% of California is currently in a severe to exceptional drought condition. Drought has impacted California agriculture in different ways in different regions. Depending on crop needs, geographic location, and availability of ground water, production of each crop is affected in one way or the other. Compared to the Central Valley which is affected most by the drought, agriculture on the Central Coast and Southern California is less affected according to a study conducted by the Center for Watershed Sciences at University of California Davis. 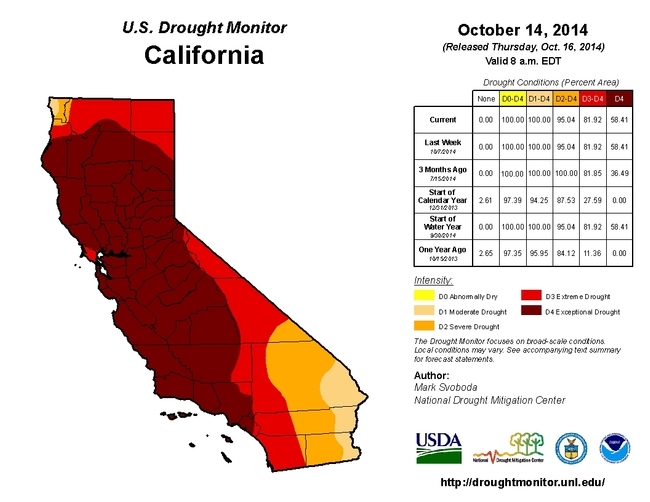 Drought conditions in California as of October 16, 2014. Source: US Drought Monitor. Some strawberry and vegetable growers in San Luis Obispo and Santa Barbara Counties were contacted recently to assess the current impact of drought. Their feedback helped to put together the following summary of the current status and recommendations to address drought conditions. Strawberries require 21-24 acre inches of water and rainfall accounts for 3-6 acre inches during normal rainfall years. Rainfall leaches salts away from the root zone while meeting irrigation needs. Compared to three years ago, it is estimated that there is up to a 10% increase in some salts, especially calcium and magnesium due to the current drought conditions. This could lead to 5-10% reduction in fruit yields, but severe salt injury could cause higher losses. Additionally, plants would be vulnerable to pests and diseases which could lead to further yield reduction. Strawberries are very sensitive to salinity and frequent irrigation is practiced to prevent the accumulation of salts in the root zone. Growers are aware of diminishing groundwater resources and are carefully monitoring water and salinity levels. Extra irrigation to push out salts from the root zone results in nutrient leaching. These practices are expected to continue as long as groundwater is available, but acreage could diminish if groundwater becomes unavailable. Continue to monitor groundwater levels and provide irrigation to meet water needs as well as to leach out salts. Monitor health of plants and regularly scout for pests and diseases which might require more timely treatment actions than usual because plants are already under stress. Check nutrient levels in the soil and plant and compensate as needed if irrigation is causing nutrient loss. Modify leaching fractions based on salt levels and plant maturity to flush salts away from the root zone. Reconsider acreage planted based on groundwater availability to minimize losses. Vegetable growers are experiencing the impact of drought conditions on their production and are currently relying on available groundwater. Water needs for vegetables vary from about 7 to 36 acre inches based on the crop and location. Rainfall during a normal season contributes up to 24 acre inches depending on the crop and season. Drought conditions resulted in increased salinity, which has caused 10-20% reduction in yields of some crops and a significant increase in pest and disease pressure. Some growers are managing without any yield losses. Some growers have already reduced their acreage by 10% or more while others continue to maintain the current acreage. Reducing or completely avoiding pre-irrigation is currently practiced by some growers to cope with water shortage. This practice has also increased salinity in the soil and increased weed populations. Some growers have reduced fertilizers or are choosing ones with less salt content. In order to monitor salinity and nutrient levels, additional expenses are incurred for water, soil, and plant analysis. Increased weed, pest, and disease problems have also increased management costs. Some growers are prepared to reduce acreage up to 25% if drought conditions continue. Continue regular monitoring of groundwater levels, salinity conditions, nutrient status, and provide irrigation and fertilizers as appropriate. Regularly monitor for pests and diseases and make timely management decisions. Reduce or avoid sprinkler irrigation and use drip irrigation as much as possible. Continue to reduce or avoid pre-irrigation to conserve water. Modify leaching fractions based on the current salt and crop conditions and administer irrigation as needed. Modify acreage to suit future water availability. 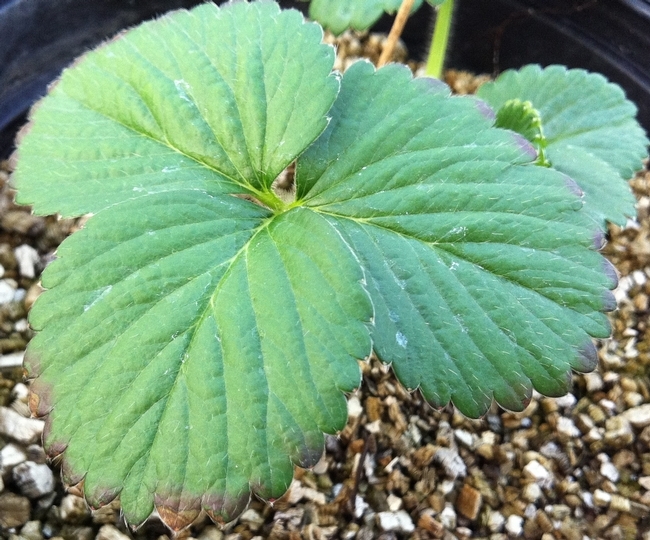 My current research is evaluating the potential of entomopathogenic fungi in improving water and nutrient absorption by plants, which could play a role in conserving water resources. Acknowledgements: Thanks to the strawberry and vegetable growers in San Luis Obispo and Santa Barbara Counties who responded to the survey on drought impact and provided their valuable feedback.